So I thought I would finally let everyone in on a recent project I've been toying with for the past few weeks. It's far from ready at this point, but I'm planning on throwing it up on CodePlex in the coming weeks to open it up to all those who would want to help me get it up and running. It's a Forums Client for MSDN. One has been attempted before by a group of people at Microsoft, but the APIs all changed and all the original developers working on the project have long since moved on to other projects. In fact, Rob Johnson, who gave me some of the information about how to access the information more simply than screen-scraping has himself already moved to another group within Microsoft. 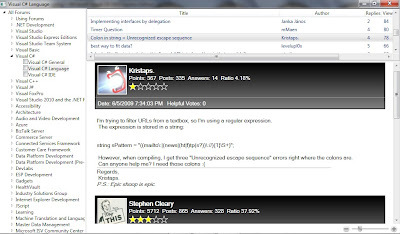 I feel it's important that those of us who use the Forums heavily ought to be the most invested in coming up with some kind of desktop solution, as we're the ones for whom such a client would most directly benefit. I myself have written three or four clients for the MSDN Forums just for my own personal use, and have found them to save me tons of time in not having to switch windows and refresh pages. Unfortunately for my clients, the first few no longer function properly as they were mainly based on screen scraping, and the site has changed a few times in the last couple of years. Anyways, without further ado, here's a small screenshot of what I've got so far. Again, as I've said, at this point the solution is very half-baked and not even close to ready for prime-time. Microsoft, if you're listening, I'd love to have a way to use the Live Id Client to post responses directly from the client.